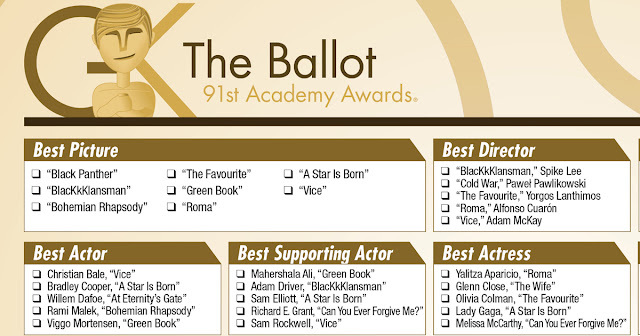 The Gold Knight has designed a one-page printable ballot for the 2019 Oscars. Download it now! The Gold Knight has designed a one-page printable ballot for the 91st Academy Awards. 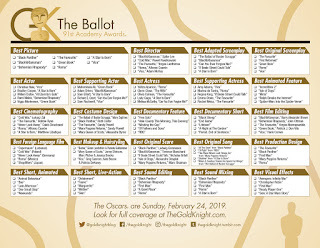 This gorgeous ballot is the perfect complement to your 2019 Oscar Party or office pool. Download the ballot, print it out and pass out at your workplace or during your party (go here to download the PDF). It's in glorious color. “The Favourite” and “Roma” are the most nominated films, earning 10 nominations. “A Star Is Born” and “Vice” follow with eight nominations apiece, with “Black Panther” earning seven. “Black Panther” is the first comic book-based film to earn a Best Picture nomination. With 10 nominations, Netflix’s “Roma” has tied the record held by “Crouching Tiger, Hidden Dragon” (2000) for the most nominations received by a foreign language film. It is the tenth foreign language film nominated for Best Picture and the fifth film to be nominated for both Foreign Language Film and Best Picture in the same year. We'll find out on Oscar Sunday, February 24, which movies take the top prizes. Enjoy and share/tag pictures of your predictions and ballots with us on social media! 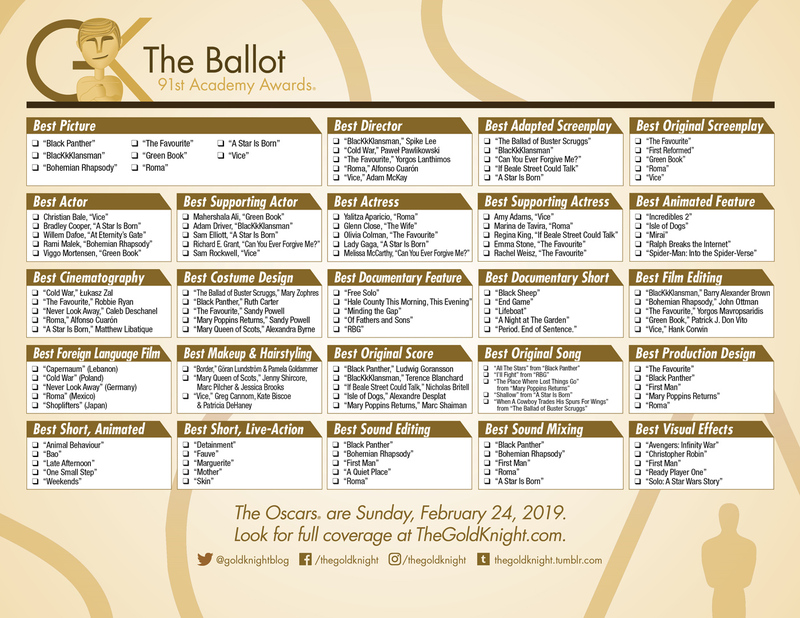 RELATED: Download our 2019 Oscars Movie Checklist; have you seen all the films?